Tahal and its local partner ZRB signed a 7 years Operation & Management agreement in Quiminha Project, Angola, for expected total revenues of $370M. 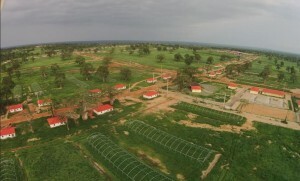 The Quiminha Project is a communal agricultural project, located 70km east of the capital Luanda over an area of 5,000 ha. In an earlier phase, Tahal was assigned by the government of Angola to provide a full range of services to make the land suitable for agricultural use and to build the infrastructure for full communal and commercial services for the farmers and inhabitants. After successfully handing-over this project in mid-2016, Tahal has now been assigned with its partner for the operation and management of the site. According to the Agreement, Tahal and ZRB will operate and manage this agricultural project of 5,000 ha which includes 300 private farms of 10 acres each, thousands of acres of crops, grains, vegetables and fruits in open areas and in green houses and chicken coops. The Project furthermore comprises water infrastructure and water treatment, irrigation, and various facilities in relation to crops, live-stock and the distribution of products. The extent of crops expected in the Project will reach approximately 60,000 tons of agricultural products per year to be sold in the domestic market. Tahal Angola will be entitled to the entire proceeds arising from the sale of the agricultural products, estimated at an average of $ 52 million annually for the duration of the Agreement. Under the Agreement, Tahal Angola undertook the responsibility to supply all equipment necessary for the operation of the Project, employing managerial and professional teams to operate the Project, and to pay a franchise fee to the government of Angola which has rights in the Project. The expected revenues from the Project of $ 370 million are in addition to the current backlog of Tahal Group of more than $ 300 million. From the beginning of 2016, Tahal new orders crossed the 450 million dollar line, all are for immediate execution, and not depended on financial closing and/or regulatory approvals.